Staying in cheap hotels in Pattaya is not the same as travelling on a budget in other parts of the world. Budget hotels here in Pattaya offer a lot more than just a comfortable room. What would get you little more than a hostel in most major destinations, you can get relatively luxury here in Pattaya, swimming pools, fitness centers and more all on the cheap. Pattaya is one of the best cities to travel on a budget and the cheap hotels are plentiful. Although all budget hotels in Pattaya are not equal, some will be very basic and only offer you a room and maybe Air-con if your lucky. That’s why we have researched the best cheap hotels in Pattaya, to ensure you get the best value for money. The below list all offer something more than just a basic room, on the list you will find swimming pools, fitness centers, great restaurants and more. All for a relatively cheap price. Booking early is the best way to ensure you get the best value for money hotel rooms. And on top of that we have teamed up with Agoda.com to ensure you get your chosen room at the best possible price. Simply click the “Check Prices” button below your chosen hotel. 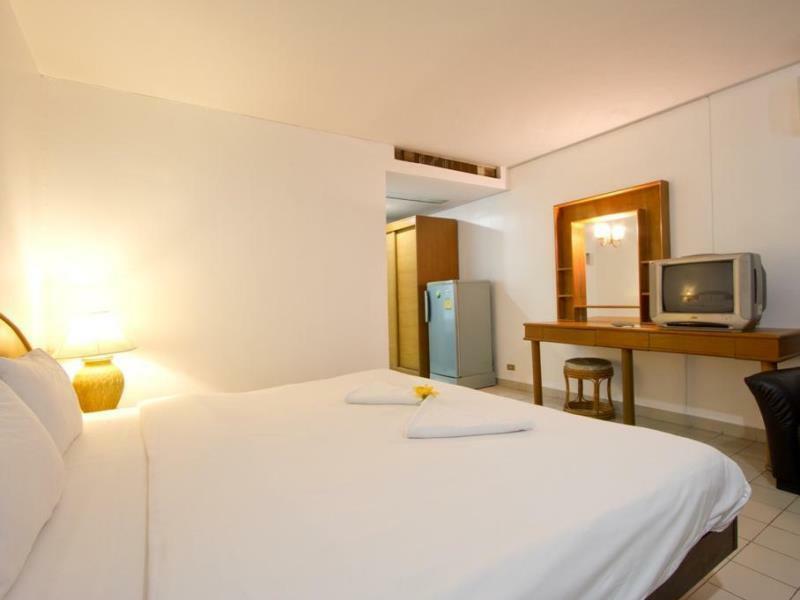 Located right in the heart of Pattaya is the super cheap hotel “Pattaya Loft”. THis is number 1 on the list as it is a prime example of just what your money can buy you here in Pattaya. Located less than a 10 minute walk from Pattaya Beach, the hotel is just off central Pattaya road and is great for exploring. Not only are you 10 min walk to the beach, but central festival shopping center is also less than 10 mins away. The nightlife area of Soi Buakhao and LK Metro are also an easy walk away, and Walking Street is a 5 minute taxi journey. The rooms are super comfortable, large in size and there are five different types to choose from. The amenities on offer at the loft are :- Free Wifi, Full service Spa, Indoor swimming pool, Rooftop terrace, free shuttle to the beach, and childcare. With rooms starting at only $30US a night in low season you really do get a lot for your money here, an excellent all round property for anyone looking for a budget hotel. My personal favorite budget hotel to stay at is the Sugar Hut resort, this is where I advise friends to book. Located just off Thepprasit road in Jomtien the hotel is only 2 km from Beach road and Walking street and also 2 km from Jomtien beach and all its nightlife. Thepprasit road also leads direct to Sukhumvit road if you are wanting to explore further afield. The rooms here are large and very very comfortable. With large beds and private bathrooms, flat screen TV’s and even your own fridge and microwave. Most rooms also have large seating areas. Making them a very comfortable choice for the longer term stays of 2 weeks or more. The onsite restaurant is also one of Pattaya’s best restaurants serving international food. On site guests have the following facilities at their disposal:- Large outdoor swimming pool, Pool bar and restaurant, free shuttle bus, gardens, picnic area and free Wifi. 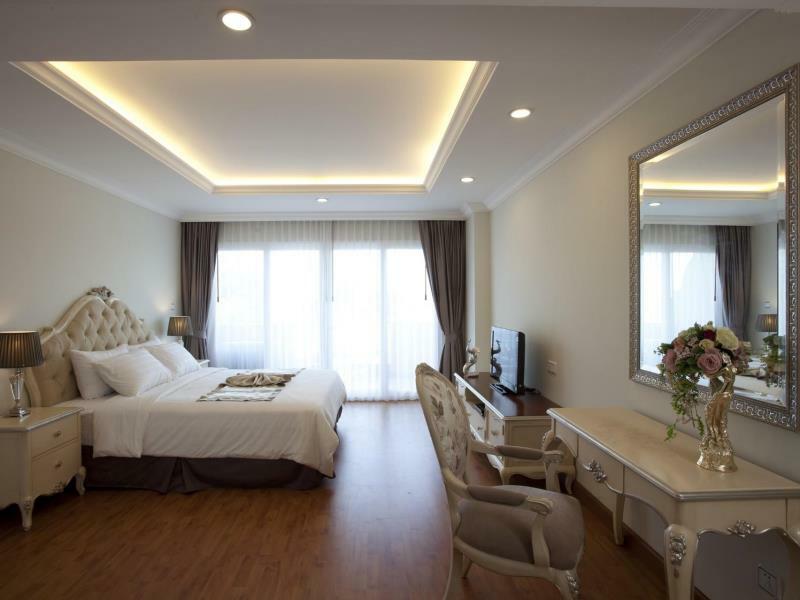 This is the editors choice for long term affordable accommodation in Pattaya. At the LK Noble suites you really do get great value for money. This medium sized property is very opulent and more akin to a chic Paris boutique hotel. Located in North Pattaya, close to the Sukhumvit highway the property is prefect for those looking to explore the wider Pattaya area and all its attractions. The hotel is also close to North Pattaya road, where you can easily catch a baht bus down to Walking Street and Pattaya Beach for only 10 baht. Or if you prefer jump on a bike taxi and you can be anywhere in Pattaya in less than 10 minutes. The rooms here are very large, clean and very well appointed. And the beds are super comfy perfect for sleeping off all the partying. All rooms come with complimentary buffet breakfast and free WIFI. Onsite guests can enjoy the outdoor swimming pool, onsite fitness center, plush gardens, terrace and business area. The IBIS hotel in Pattaya was built in 2009 and still feels very new even now, the place is immaculate. If you are looking for a great budget hotel in Pattaya, backed up by a renowned international company then the IBIS is for you. Located at the Northern end of second road the hotel is in a very enviable position. From here you can easily access the baht bus system to get around town and down to Walking Street. The central festival shopping mall is a short stroll, as is Pattaya beach. Inside this hotel guests can expect the usual from an Ibis property. Well appointed and clean rooms, with large private bathrooms. All of which come with free WIFI and Air-conditioning. At the hotel guests can also enjoy the outdoor pool, onsite restaurant and bar and computer room. The property is also surrounded by many great bars, restaurants and attractions. This is a great and cheap hotel right in the center of Pattaya and perfect for any traveler wanting a great location. The Sawasdee place hotel is a little gem of hotel, and rooms start at an amazing $14US a night. You would be hard pushed to find a cheaper hotel in Pattaya of this standard. In fact other hotels of this standard go for at least $25 us a night. The reason this hotel is a cheaper than its peers is location, towards the northern end of Naklua, which is a little further out of town than most people would like. But the hotel is close to a baht bus route and you can easily get to central Pattaya for only 10 baht and in less than 15 mins. The rooms here are spacious and well decorated, and have large beds and a seating area. 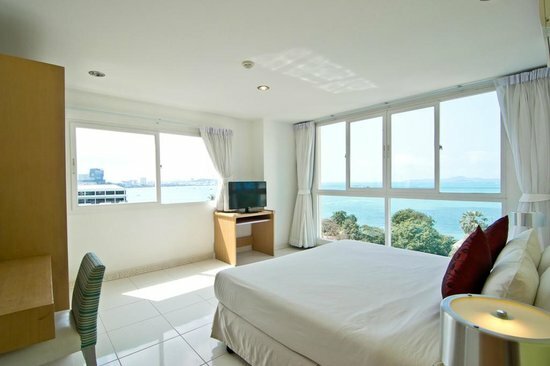 If your planning an extended stay in Pattaya then they are great rooms. Each room has Wifi, air con, private bathrooms (with baths) and cable TV. The hotel is lacking a little in facilities but does boast its own swimming pool, tour desk and restaurant. The beahc in Naklua is only a 10 min stroll away. 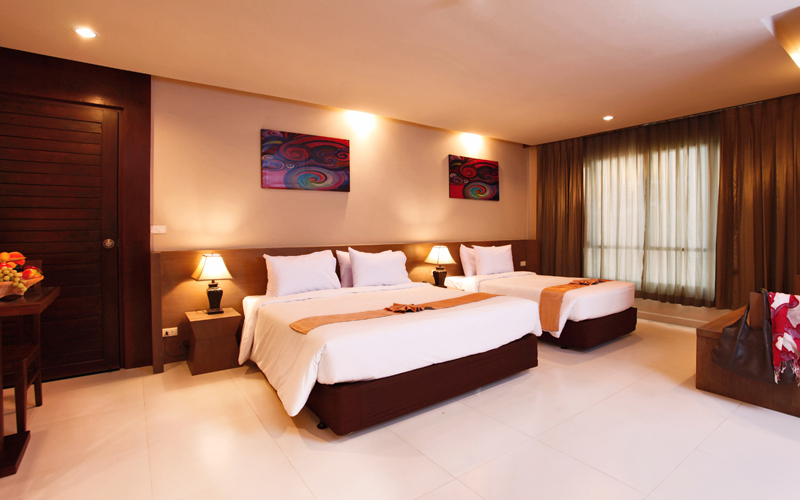 This is the perfect budget hotel for any traveler looking for an extended stay in Pattaya. JP Villa’s is another great cheap hotel in Pattaya. Don’t let the name here fool you, these are not individual villa’s, this is normal style hotel with en-suite guests romms. Located to the north of Pattaya close to both Pattaya north road and Sukhumvit highway it is in a great spot for exploring many of Pattaya’s attractions. For thos wanting to head into central Pattaya for the beach or shopping then simply jump on a near by baht bus and you can be in town in less than 10 mins for only 10 baht. Walking street and the nightlife action is again less than 10 mins away on the baht bus. The rooms are fairly large for the money, and all come with either a large king bed or twin beds. As well as en-suite bathrooms and cable TV’s. The hotel also benefits from its own swimming pool, restaurant, terrace and air-conditioning throughout. JP Villa’s is a great budget choice for anyone wanting quality at a very affordable price. 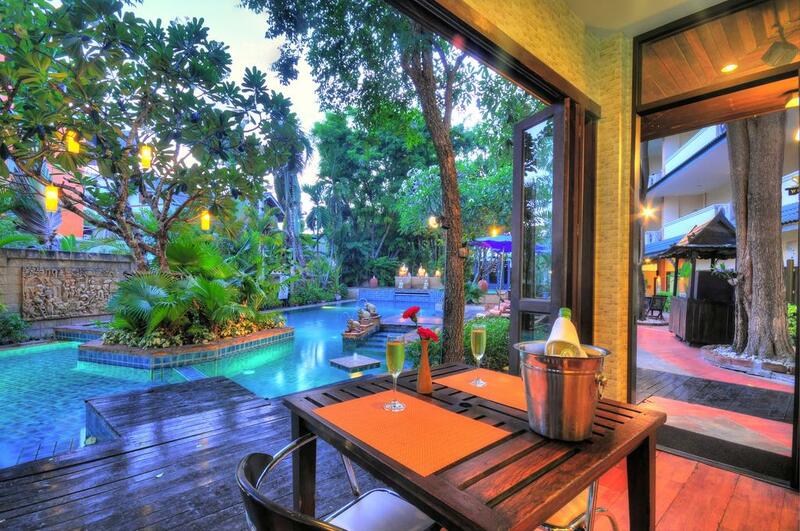 Located at the top of Central Pattaya road, the Citin Garden resort has a the perfect location. It is on the baht bus route, close to Sukhumvit to explore. And the hotel is surrounded by many great restaurants and bars. If you wanting to head into the town for shopping and the beach then the baht bus from over the road will take around 5 mins and cost 10 baht. Pattaya’s amazing nightlife of both Walking Street and LK Metro can both be reached easily on the baht bus in only a few minutes. The rooms here at the Citin are very generous is size, and decorated in a modern sleek manner. All of which come with large private bathrooms, Air-conditioning, flat screen TV’s and a seating area. On site guests can enjoy a Rooftop terrace, outdoor pool, free shuttle, lush gardens, restaurant and bar and on site deli. 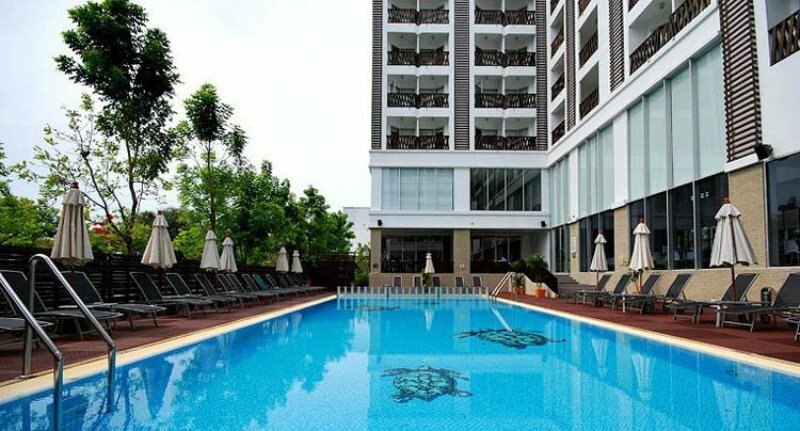 The Citin is a great affordable hotel right in the heart of central Pattaya and is the perfect choice for travelers looking to get the most from the holiday and be near all the action. Its hard to believe you could find a beach side resort in any town for $38US a night, but here in Pattaya you can. The Best Bella resort sits right at the edge of one on Pattaya’s better beaches, Naklua beach. 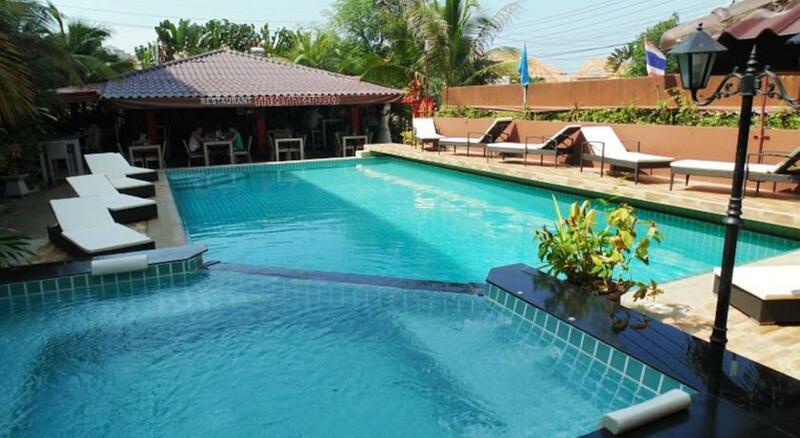 Located in North Pattaya on Naklua Soi 24, the hotel is just a stones throw from the ocean. Dolphin roundabout is only a few minutes walk away, from which you can catch a Baht bus all the way down beach road to explore all off Pattaya’s shopping and entertainment such as Walking Street and Central Festival. If your after the bigger attractions then the hotel is perfectly located to quickly get to Sukhumvit road. The rooms at the Best Bella are large, modern and clean. They all come with free WIFI, comfortable beds, large scree TV’s and well appointed private bathrooms. Facilities on offer include:- Restaurant, Bar and lounge, Rooftop terrace, Outdoor pool, fitness center and children’s club. The Best Bella is a great choice for any family or couple looking for a resort style cheap hotel in Pattaya.